Upon returning home, from a road trip, in the middle of November, I saw a hummingbird dart out of the large rhody in the backyard to the nearby feeder, a little sugar-water still in it, hover and drink, and then dart back into the rhody. 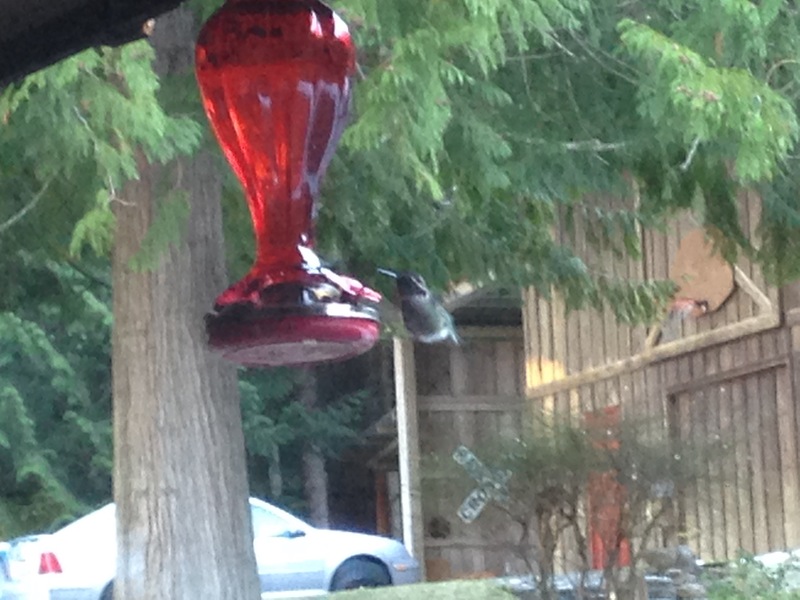 A hummingbird in November—a novelty to me. This one had bright red over its head and neck, a male Anna’s hummingbird. I immediately boiled water and poured a cup over a quarter cup of sugar, stirred until the sugar dissolved and then let it cool. Usually the hummingbird feeder gets cleaned and stowed sometime in October. Since the feeder was being used, I had left it up, expecting it to be unused when we returned. Why had the hummingbird stayed? How was this year any different from the last? Had the conditions out in the world changed? Had his usual wintering grounds become less hospitable? Was our yard somehow considered a safe haven? I only knew that I could control, to some extent, the hospitality of our yard. A trip to the garden shop to find out what blooms during the winter introduced me to their resident hummingbird who flew in through two open doorways to sup on the hanging fuchsias in the warm store. She, no red hood, navigated the obstacles including the patrons, with a calm and focused air. Perhaps it is the hummingbirds’ ability to hover that gives them a kind of intelligence, a patience, the ability to be in the present moment, not always flying from here to there. I bought two hellebores, already in bloom, and hardy to 10 degrees. My conversation with the gardener reassured me that I already had some winter blooming plants: heather, camellia, primroses. Hummingbirds also subsist on insects, to the point of hanging out by spiders’ webs. And there was my feeder, a red glass beacon, which I would dutifully keep full, and bring in on the freezing nights and get back outside at first light. Taking care of this hummingbird took on an unusual urgency: I felt obligated and responsible, but also a great joy as I stood at our back door with my mug of hot lemon water or tea and stared out the window panes at the feeder, almost holding my breath until an iridescent sheen descended from the rhody to the feeder. He’s still here! Every morning I watched. Every morning I said those words. He’s still here. Would he stay all winter? It gets cold on the flank of our mountain; it snows. While the temperatures were in the low forties and high thirties, I’d go out to the rhody and hear him chattering or see him sitting inside on a branch or he would buzz out to the feeder, less of a greeting and more of a territorial display. Then the temperature dropped into the lower thirties. I brought in the feeder that night, and the next morning put the feeder back out at 7am, in the dusky light of snowflakes sifting out of the sky. I went out twice more that day, right up to the rhody, and both times there he was hunkered on an outside branch. He needs a home, I thought. And googled hummingbird houses and all sorts of cute images came up but then I read the scientific articles on reputable sites, the articles based on fact, not fancy: hummingbirds will not use those cute little homes. I realized I was doing all I could for him. Diligently providing sugar water was my best course of action. The next day dawned clear and 31 degrees. I don’t see him. I worry. I get depressed as if I’m personally responsible for his absence. The day after that was clear and 24 degrees when I put the feeder out at 7am. I stood there and listened. Other birds were about, chirping and flying from their tray feeders to bushes and trees. No distinct hum or distinct chatter of my little guy. I am sad. But maybe he’s just flown down the hill to a slightly warmer neighborhood. I feel abandoned. Later that morning I stood at the back door with my cup of hot lemon water and stared at the red feeder. Larger birds, nuthatches and sparrows and even a stellar jay dart everywhere. I’m worried, I’m sad, I want to go back to bed. The dull light and my tired eyes make it hard to focus. I put down my mug and grab the binoculars. I focus on the glass feeder and he flies in, red headdress shimmering. He’s alive! He looks strong, hovering at the feeder, dipping into the plastic flower, and then he zooms back into the rhody. He’s alive. He’s drinking out of the feeder. My efforts matter. I am energized—I am alive. I also know that feeder won’t stay unfrozen all day in these temps; I’ll need to bring it in; I wish I had another one to alternate with. I add it to my shopping list, wonder if the stores are even carrying them this time of year. Three hours later, the sugar water is almost frozen. I bring it in, set it by a heater vent. I fill the kettle. I’ll make a new batch, stronger, three to one, to delay the freezing a bit, to give him more fuel. I decide to hang it on a hook under the eaves near the breakfast nook windows, a slightly more sheltered spot, but now I’ll worry until I see that he has found the new location. All this worry, I haven’t felt this way since my children were small. Wonderful story, Laura. I just watched a Nature program on hummingbirds. If you missed it you may be able to stream it from PBS website. There are hummingbirds that can over-winter here. So beautiful! Thanks. The hummingbirds seem too fragile to make it through the winter here, but obviously they are hardier than they look. I saw one at my feeder yesterday! Can you imagine? Thanks for all the information on keeping the feeder available to him. People also heat the feeders, with special heaters, or wrapping Christmas lights around the glass part. My system seems to be working well enough – brought the feeder in once this morning to defrost for five minutes by the heater vent.